As more people catch on to the attractions around the Barrington region, competition is rising among businesses that want a piece of the action. Uncover some of the positive trends shaping this go-to destination. 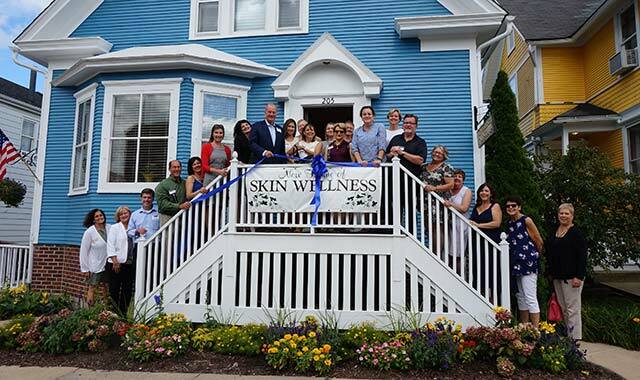 Skin Wellness by Renee, in Barrington, cut the ribbon on its new location this past August. The Barrington Area Chamber of Commerce has cut more than 40 ribbons so far this year. Take a drive through downtown Barrington some and you’ll notice a lot happening in this quaint community. Unique businesses bustling with activity, restaurants with tables filled, a family-owned movie theater and an historical social events venue attracting visitors with a busy calendar of artistic and social events. And, there are the constant street festivals and community events that can draw hundreds of people in a single night. But the activity isn’t limited to the village of Barrington alone. Stop by some of its neighboring communities, like South Barrington, Deer Park or Long Grove, and you’ll notice a very similar flurry of activity. The increasing economic activity excites Suzanne Corr, president/CEO of the Barrington Area Chamber of Commerce. With nearly 900 members in 11 Barrington-area communities, the Chamber serves a variety of entrepreneurs, small-business owners, professional services, restaurants and retailers – both homegrown shops and national chains that have made the region a go-to shopping destination. In every corner, the story is the same: People in this part of northwest Chicagoland are feeling upbeat about the economy, and businesses are increasingly confident in their chances of success, even as governmental issues gnaw at their competitiveness. It’s nothing that residents of this community can’t find their way around. We sat down with Corr to get a better sense of what’s happening in Barrington’s business scene, where the signs of growth appear, and how local leaders are overcoming persistent challenges. What are some of the most encouraging economic indicators you’ve seen around the greater Barrington area? The Barrington area is really thriving. We’re seeing a lot more foot traffic around downtown Barrington, a vibrant and active nightlife, and community events that bring hundreds of guests from throughout the region to explore our community. The Village of Barrington has done a tremendous job driving economic development and recruiting business to the area. We have become a business hotspot. The new Village Center is at capacity and has created a strong entertainment sector downtown. Families and neighbors are gathering in the downtown to enjoy our restaurants, events and nightlife. From a chamber perspective, I’m excited that we’ve had more than 40 ribbon cutting events this year. We’re averaging three to six ribbon cutting ceremonies a month, welcoming new businesses or celebrating expansions or newly remodeled businesses. Most of the activity, though, is recognizing the official grand opening of a new business and all the hopes and dreams that come with it. Our community events have also been very well-attended, bringing out local residents and attracting people from around the region to events like Uncork Barrington, Barrington Brewfest, Barrington Street Festival and the Barrington Art Festival. The level of support from the community and the tremendous crowds are a huge indicator of the positive outlook they have for our region and the local economy. What other bright spots do we see around the region? The Barrington area is a shining star in the state of Illinois. While there is a lot of negative press surrounding the condition of our state – such as budget issues and the exodus of families and businesses – the Barrington area remains desirable and sought-after. Our new townhouse development in the downtown area, 101 West, has a waiting list of interested tenants. People are drawn to this area; people who left are coming back to raise their own families here. The attraction is what we offer. We have a top-rated high school and school district that together are establishing trend-setting programs, such as the incubator program that enables young high school entrepreneurs to get the funding they need for creative startups; the Fresh Inc. program has fifth-grade students creating a product or service. We have responsible government; first-class shopping, dining and entertainment; and neighborhoods where you can walk to a quaint downtown or enjoy expansive landscapes and horseback riding. Our communities work well together; we have the Barrington Area Council of Governments, a unique organization that pulls area municipalities together so they can efficiently collaborate. All of these things set us apart. Together, this makes us a destination for families and businesses. The new Village Center in downtown Barrington seems like a big hit. How has it impacted the neighborhood? The Village has done a wonderful job creating a high-quality cluster of services and businesses there. The town center brought new restaurants – Shakou and Neoteca – and professional services, like 18|8 Fine Men’s Salon, College Nannies + Sitters + Tutors, and others. It has created a hub of activity and has brought more more foot traffic exploring the other unique boutiques, restaurants and businesses nearby. The new Flesk Brewing Co., in the nearby Ice House Mall, is another popular destination. In what sectors do you see the most new job opportunities? The Chamber helps to promote job openings, and we’re seeing a lot of opportunity in the restaurant and retail sectors. Local manufacturers have openings for skilled workers, but they’re challenged to find those candidates because young people aren’t necessarily going into the trades. But, the trend is changing, especially with local community colleges offering many trade options as a viable career path. Young people are filling many of the area’s retail and restaurant jobs, and they’re also helping to drive the economy. In years past, you’ve said millenials were slow to return to the Barrington area. Do you see that trend reversing now? We’re hearing from Realtors that the trend is reversing. The quality of our Barrington Community School District 220 is a big draw. For people who were born and raised in this area, when they’re ready to raise their own families, this is one of the first areas they think of coming. I don’t know that it’s entirely millennials, but we are seeing younger people buying properties and living near their parents. That’s a whole new segment of the population that’s getting involved in the community and engaging in local causes and nonprofits, and enjoying restaurants and entertainment. Our senior community is also very strong. This is a big destination for retirees and perhaps another reason young families are choosing to live close to parents. The Barrington Area Council on Aging is top-notch in the programs and support services it provides to local families caring for loved ones. We have award-winning senior communities like The Garlands and others. According to the North Shore Barrington Association of Realtors, home sales are up, sales prices are rising and supply of available homes is decreasing. What impact does this activity have on Chamber members? A lot of the communities we support have noticed a jump in the housing market, and that brings more families who can support local businesses and benefit from the services we provide. 101 West, the new luxury apartment complex that’s being built, is going to bring a lot more foot traffic to the downtown area because people love to be able to walk to where they’re going. Many people are looking for alternate ways to get to places. Do you think we could see more development like this happening in Barrington? I think this is a first step in that direction. Bringing a concentrated population of residents closer to downtown is good for the many services being offered by downtown merchants. Transportation is always on the minds of suburban residents and city/regional planners. A new interchange is opening at Barrington Road and Interstate 90, and there’s talk of addressing the railroad crossing at U.S. Route 14. What transportation issues are most on the minds of the Chamber’s members? The I-90 project is going to add more access to the area – certainly to Barrington and South Barrington – but it’s also making it possible for us to have alternate ways of getting places. It’s bringing in bike paths and a Pace bus station. Communities are really examining alternate transportation methods. People like to have options. I know the Illinois Department of Transportation has also rolled out its five-year plan for the region and it mentions widening Barrington Road from Algonquin to Mundhank Roads and adding new lanes. That’s going to ease congestion and improve accessibility in both directions. I believe that plan would also add bike paths. That’s a trend now, for communities to do infrastructure improvements that enable alternate transportation. No doubt the region’s main shopping centers will factor into transportation plans. How’s business at some of the national chain-anchored shopping centers? One of the things we’ve really seen in South Barrington is a push for entertainment and restaurant venues. The Arboretum of South Barrington has become a hub for entertainment and gathering. If you go there in the evening, you’re going to see a lot of parking spots filled. Restaurants bring foot traffic and an opportunity for people to discover the retail resources that are available there. Deer Park is also thriving and is noted as one of the top malls in the country. Malls are taking a different approach to marketing by becoming town centers. That’s why, if you look at The Arboretum, they have an ice rink in the winter, and they have the farmers markets and car shows in the summers, and outdoor concerts. Deer Park has outdoor yoga, a jazz festival, an art festival, concerts and more. Local families are drawn to the malls for things to do. They are destinations. Downtown Barrington has created this family feeling as well. There are so many community events, many with children’s activities, so there’s always something to do. Downtown and the malls have become gathering spaces, and that feeds and fuels the businesses located there. Together, it creates a rich quality of life for residents. What issues keep your members up at night? I think some of the biggest challenges are related to what’s going on in the state: the increase in taxes, the major cuts in services, the cuts in monies supporting local governments and nonprofits. We have a huge number of nonprofits in this community, and this community has done a good job of sustaining its nonprofits, independent of the state. That’s very important, because nonprofits add an important dimension to the quality of life you can offer residents. Our region also faces challenges at the county level, when county government imposes taxes or mandates. We have a unique situation because the dividing line between Cook and Lake counties goes right through the middle of downtown Barrington. With Cook County’s soda tax, for example, if you’ve got a restaurant on the Cook County side of the street gazing into the window of a restaurant on the Lake County side of the street, each has to abide by a different set of rules. That can affect their competitiveness. As a Chamber we voice our concerns on behalf of our members, and as a community the Village of Barrington was able to opt out of Cook County’s mandated sick time and minimum wage. We feel that our businesses, in order to be competitive, need the flexibility to make their own decisions about the kinds of people they hire and how they’re compensated. What other legislative issues are you monitoring? We’re concerned about loss of funding to education and nonprofits, because those are strong benefits and strong presences in this community. Our school district has been phenomenal at having a balanced budget while offering top-rated services and programs. The loss of funding to support local governments is troubling because that has to be replaced in other ways. Flooding on the Fox River affected many riverside communities, including Port Barrington and Lake Barrington. What effect has flooding had on businesses there? Local residents really rallied to do what they could to continue to support those businesses that were affected by flooding. I think that speaks volumes to the loyalty this community has for its own. For Broken Oar Bar & Marina, which was underwater, flooding didn’t stop people from showing an outpouring of support. Why? Because so many business owners are so invested in their communities. They live, work, play and socialize here. When things are good, people are supporting them, and when times are tough, people are supporting them. We got through it together. Philanthropy seems like an integral part of the culture. Philanthropy is engrained in the culture here, and the Barrington Area Chamber of Commerce is dedicated to that spirit of giving as well, whether it’s through volunteerism or donations. What’s unique about our Chamber is that, as an organization, we invest and give back nearly $18,000 a year to community groups and organizations. We’re going to give back an estimated $7,000 from the Uncork Barrington event we hosted in July. We award more than $4,000 in scholarships every year. We try to support and donate to events and causes every year. It’s very important. We want to show how much the chamber is invested in the people we support and who support our members. I don’t know many chambers that have a lot of money to donate back to the community. But, we have a very strong commitment to giving back and supporting the community we represent. We are very fortunate here. We have people who are committed to volunteering, supporting the chamber, supporting local business and shopping locally. I believe that’s what’s truly driving the interest to be here. We’ve got a lot of invested, interested and dynamic people. What might the next 12 months bring to the Greater Barrington region? If I look at my Chamber calendar, I’m still scheduling ribbon cuttings for the months ahead. Those ribbon-cutting events are happening everywhere in our region. Downtown, Moretti’s Ristorante & Pizzeria is renovating a space and plans to open soon. The luxury apartment complex will open and bring a lot more foot traffic to the downtown area to support the businesses there. Nightlife in our region is continuing to blossom. We have award-winning restaurants downtown and at our area malls – and that helps to drive opportunity for local business. We really feel blessed. We live in a generous community where people are invested in the quality of their community, their businesses and their neighborhoods. That’s a driving force for businesses that want to be here. We are definitely a destination and a shining star. There’s no exodus from our area. This entry was posted on Tuesday, September 12th, 2017 at 12:00 pm	and is filed under Northwest Business Magazine, Top Posts. You can follow any responses to this entry through the RSS 2.0 feed. Both comments and pings are currently closed.